Dhaka, 12 August, Abnews: The country is unlikely to face any shortage of cattle during the Eid-ul-Azha this year as the supply of locally-reared cattle is quite enough to meet the demand of sacrificial animals, said officials. According to the Fisheries and Livestock Ministry, there are now 1.16 crore sacrificial animals in the country for the upcoming Eid-ul-Azha against last year’s 1.04 crore. The ministry also said there are 44.57 lakh sacrificial cattle and buffalos while 71 lakh goats and sheep across the country. On the other hand, the number of healthy sacrificial cows and buffalos is 29.20 lakh while that of goats and sheep is 18.26 lakh and the rest are unproductive animals. Visiting different designated cattle markets in the city, the UNB correspondent found the works have started for establishing the cattle haat (market) and they said the supply of locally-reared cattle have been increasing for the last several years cutting dependence on neighbouring countries. They hoped that the supply of sacrificial animals will be adequate this year as in the past few years. Locals predict that even if cattle are not imported from India, it will leave no impact on the market this time for the supply of adequate sacrificial animals. Bangladesh Meat Merchants' Association (BMMA) is continuously working on cutting dependence and restricting the entry of Indian cows into the local market through different programmes. The leaders of the association informed that their campaign helped the local production grow. Once, BMMA says, cattle from India used to meet around 40 percent of the need for sacrificial animals during the Eid before the neighbouring country put restriction on cattle supply to Bangladesh. Dependence on cattle of India and Myanmar has been on the decline for the last few years, leaders of the association also said. 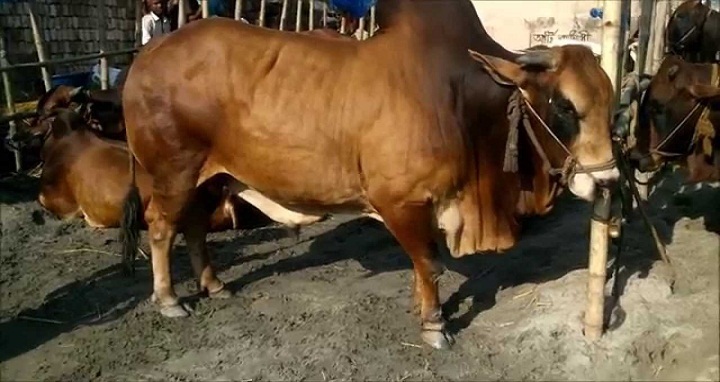 Dr AK Fazlul Haque Bhuiyan, a professor of Department of Animal Breeding and Genetics of Bangladesh Agricultural University, told UNB that there is no doubt that local production will meet the demand of the sacrificial animals as local farmers are rearing huge cattle. Besides, the customers prefer the local ones during the Eid. He said inadequate cattle inflow from India for the past few years has paved the way for local farmers to rear cattle in huge number, which have been playing an important role in meeting the demand of cattle in the country. According to Border Guard Bangladesh (BGB), 3.15 lakh cattle entered the country from India from January to June this year. Dr Hiresh Ranjan Bhowmik, Director General of Department of Livestock Services (DLS), said they have already asked the authorities concerned to strengthen vigilance along the border to prevent the entry of cows from India. UNB correspondents from Jessore, Satkhira, Chapainawabganj, Kushtia, Panchagarh, Thakurgaon, Kurigram, Lalmonirhat, Cox's Bazar, Teknaf, Chuadanga, reported that the influx of cattle from across the border has drastically come down ahead of Eid-ul-Azha, thanks to enforced vigilance by BGB and BSF. The UNB correspondent at Benapole, a upazila of Jashore district, says the cattle influx from India through the border has come down compared to the last few years.